Nestled in the heart of Houston’s Museum District, Presbyterian School is a testament to the value of the arts working in tandem with education. As you enter the parking lot, there’s a bit of commotion as cars, buses, and pedestrians share the road in a hurry to drop off and hastily reach the art. 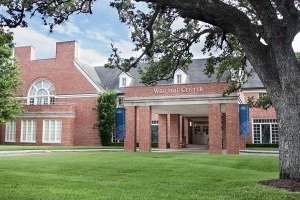 Presbyterian School faces the Museum of Fine Arts, Houston, and is surrounded on all sides by other museums and galleries. The vibrancy felt is real and sustained as you enter th e school’s Welcome Center, although a bit more reserved as the colors of saints and disciples stream into the foyer through stained glass. Mr. Philip Cannon, Presbyterian School’s Middle School Head, offers warm greetings and a quick tour through the early childhood classrooms on the way to Dr. Mark Carleton’s office, the school’s Headmaster. The instructors faces are pleasant throughout the halls. Lined up against the walls along the classic black & white tile floors, there are tiny book bags in cubbies and little aprons with names stitched in yellow, stained with finger paints. Presbyterian School’s relationship with the Museum District manifests in many different ways, as evidenced in everything from the parking lot to the curriculum. Mr. Cannon notes the school’s desire to build a new building and improve upon the school by integrating further with the Museum District through strategic partnerships planned out over the next decade. “I want our students to feel as comfortable in the halls of the museum as they are inside the walls of our school,” Dr. Carleton says, describing how the museums have generously provided time and resources to work with their young neighbors. The unity between Presbyterian School and the Museum District is mutual, as Mr. Cannon details how the school’s students often serves as a guinea pigs for young museum docents and fellows to test their lessons on bright, eager minds. Presbyterian School played an integral role in the museum’s initiative to create middle school curriculum utilizing the arts. Teachers at Presbyterian School collaborated and worked with educators at the museum on their Learning through Arts initiative. Mr. Cannon details how Lower School students create their own mini-museums- each one highlighting a unique sector of the school’s curriculum spanning a variety of subjects including science, social studies, literature and the arts. Students display their knowledge in creative ways each year at the school’s mini-museums. Sections of the School are transformed by students into museums which include the Kindergarten Circus museum, the Dinosaur Museum, The Back Forty Museum, The Wax Museum and the Texas Museum. As part of their learning experience, students gain a lot of practical knowledge in designing, marketing and curating a museum. Younger students especially love teaching about everything they have learned. Presbyterian School’s collaboration with the Museum District offers a unique opportunity to help provide them with tools to describe their knowledge even more sharply, by understanding the value of the combining arts into education. Dr. Carleton, a Louisiana native and the son of educators, knows firsthand how essential the arts and education are to holistically developing a child. In many ways, this leads to a laissez-faire approach to student learning. Both Dr. Carleton and Mr. Cannon have set fluid boundaries that allow their teachers to produce lessons that are experimental in nature, but often have excellent results due to the administration and school’s mutual love of sparking discovery in student’s minds. The confidence that Presbyterian School places in its faculty helps build and push forward the school’s motto of “Confidence in every Child.” “That’s what’s most important. I want each one of our students to walk out of here self-assured enough to be bold, nimble learners, yet still grounded,” says Dr. Carleton. To find out more about Presbyterian School, click here.